The Chicago Bears visit the Cincinnati Bengals in Week 14 of the 2017 NFL season. PFF previews the top player matchups of the game. 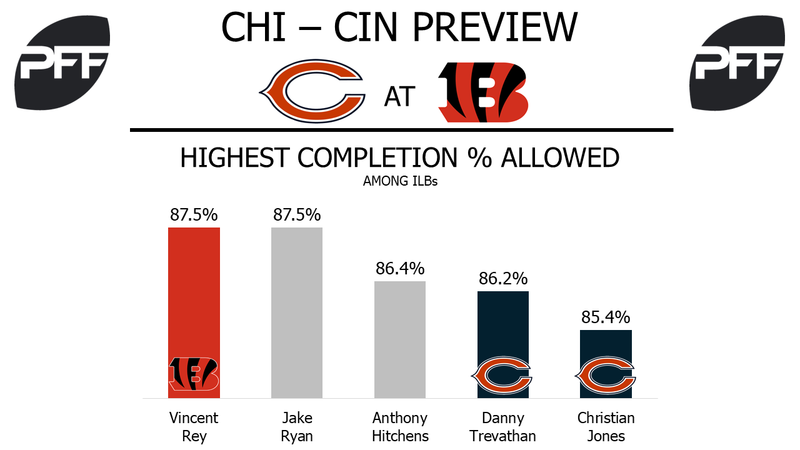 G Tom Compton vs. DI Geno Atkins – Compton is slated to take over for the injured Kyle Long at right guard. He’s started three games in place of Long at various points this season, earning a 44.6 overall grade for his work on the year. He’s allowed three hits and seven hurries on 109 pass-blocking snaps, but six of his 10 total pressures all came in Week 8 against the New Orleans Saints. Compton will have his hands full with Atkins, the second-highest graded interior defender at 91.7 overall. He leads all defensive tackles with 58 total pressures on 372 pass-rushing snaps, giving him the best pass-rushing productivity (12.2) at his position as well. RB Tarik Cohen vs. LB Nick Vigil – Cohen is still the Bears’ most-targeted receiver this season with 49. Of those targets, 26 have come while he was lined up at a wide receiver position. He’s forced 19 missed tackles after the catch, the second-most of any player, but no one is forcing them at a higher rate. Vigil has been the Bengals’ most-targeted linebacker this season, and 32 of his 56 targets have come against running backs. His 14 missed tackles are tied for the fifth-most among all linebackers, and nine of them have come in coverage after the catch. He has an overall grade of 35.1 this season that ranks 83rd at his position. 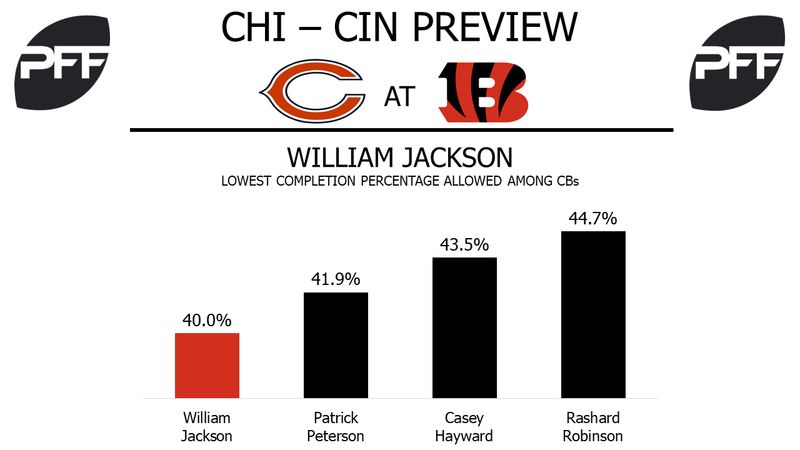 WR Dontrelle Inman vs. CB William Jackson – In his four games on the team this season, Inman has been the Bears’ most productive receiver, averaging 1.88 yards per route run. However, he’s dropped four passes, also the most among the team’s wide receivers. Of his 24 targets, 18 have traveled more than 10 yards in the air. Jackson is the Bengals’ highest-graded cornerback at 84.6 overall, which ranks 19th in the league at his position. Quarterbacks targeting him have completed just 40 percent of their passes, the lowest of any cornerback, for a passer rating of 41.1 when targeted, the second-best mark in the league. WR A.J. Green vs. CB Kyle Fuller – Green continues to be one of the league’s most productive receivers. He averages 2.36 yards per route run, the fifth-best mark, and his 88.2 overall grade ranks fourth among wide receivers. He and Andy Dalton have struggled to connect on “go” routes this season. Green has been targeted on such a route 16 times this season, but only three of them have been catchable, and he’s only caught two, both for touchdowns. Fuller has had a bit of an up-and-down season, with four of his games graded over a 75.0 and five of his games graded under a 50.0. His 89 targets this season is the second-most of any cornerback and more than twice as many as any other Bears defender. G Clint Boling vs. DI Jonathan Bullard – Boling is the Bengals’ highest-graded offensive lineman this season at 76.2 overall. His 81.6 pass-blocking grade is tied for 13th-best among guards, as he’s given up one sack and 11 hurries on 403 pass-blocking snaps so far. He has not allowed a pressure in the last four games, the longest stretch of no pressure he’s had in his career. Bullard is expected to take over for the injured Mitch Unrein. Up to this point, he’s been on the field for 37.5-percent of the Bears defensive snaps, earning a 76.8 overall grade that ranks 61st among interior defenders. He’s generated 12 stops in run defense without missing a tackle this year. TE Tyler Kroft vs. LB Christian Jones – Kroft is the 15th-highest graded tight end this season at 73.7 overall, and his 76.3 receiving grade ranks eighth at his position. However, he’s averaging just 1.31 yards per route run, the 24th-most, and has only forced two missed tackles after the catch. Jones hasn’t fared particularly well in coverage this season, and his 45.7 overall grade ranks 58th among linebackers. Of his 48 targets in coverage this season, 16 have come against tight ends, where he has allowed 12 catches for 10.5 yards per reception. Quarterbacks targeting Jones have completed 85.4 percent of their passes, the fifth-highest among inside linebackers.